They may have announced the wrong Best film winners, perhaps the greatest faux pas in the history of the Oscars, however, this year’s stars did not let us down, looking amazing and resplendent in their beautiful gowns and shoes! As all girls know, the thing that completes a look is always hair and make-up. There were some beautiful styles with abundant colour too. 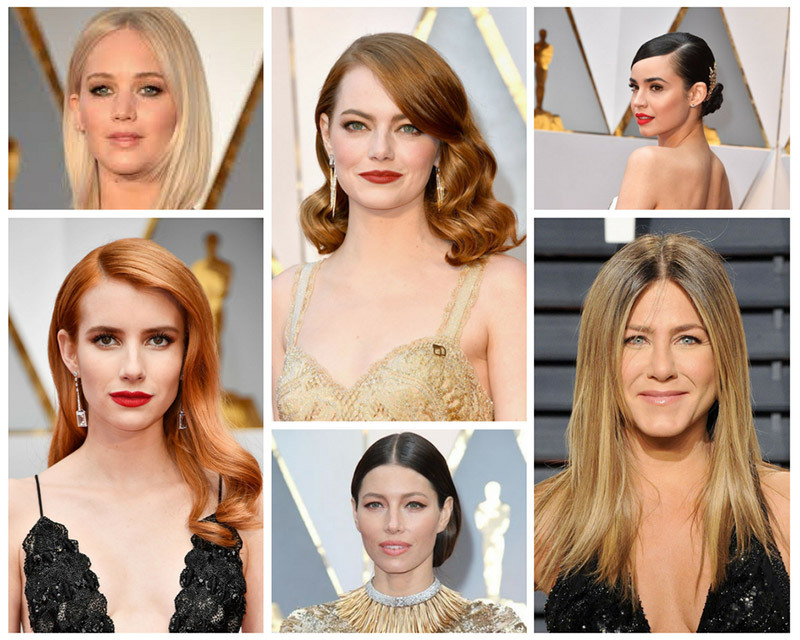 Simplicity was a big theme this year – going for effortless glamour were; Emma Roberts and Emma Stone, Sofia Carson and Jessica Biel. These styles wouldn’t look out of place in the 40’s, when glamour was everything. Strong, sultry looks with beautiful dresses and of course, high heels. Other popular styles, were simple Bob’s, accompanied by striking, strong blonde looks, chosen by Jennifer Lawrence, Katy Perry and Jennifer Aniston. Actors and actresses are always under pressure to look good, sometimes having to re-invent themselves with new hair styles and looks to keep in the spotlight. For us mere mortals, we tend to stay with our hair styles, maybe changing to a new look and colour every couple of years. There are many reasons for this, including cost and maintenance, confidence, lifestyle and outside influence. Often, clients coming into the salon for the first time will refer to celebrity hair to get across to a stylist the image they want to achieve. Media images and social media are the way we communicate with images. Everything is so accessible and fast – we can find out within a few seconds what the latest trends are – how on earth did we cope before the internet? Instagram, Twitter, Facebook, Snapchat and Pinterest to name but a few! Used wisely, they can be great tools for communication, either with images, or simply text. Which way would you decide your style with your Stylist?